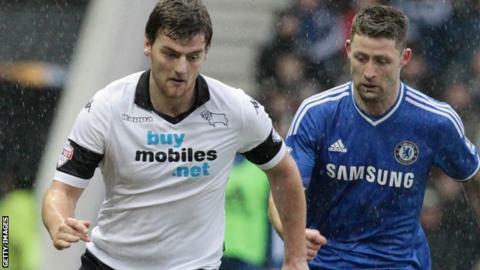 Derby County striker Chris Martin has signed a new four-year deal, tying him to the club until the summer of 2018. The 25-year-old Scotland international scored 25 goals last season to help the Rams reach the Championship play-off final and has four from six starts so far this term. Head coach Steve McClaren said: "He is the focal point of our attack but there is so much more to his game than goals. "He brings others into play and he is a real presence. We are delighted." Martin joined the Rams from Swindon in May 2013 following a successful loan stint. "He is fast establishing himself as a top Championship striker and we're convinced he can continue to develop too," McClaren added.